OUT BEST COVER YET! 2 TO 4 TIMES THICKER THAN OTHER MANUFACTURERS. This is our most rugged and heavy duty cover yet. It is the best of the best. You spend good money on your boat....fuel, oil, maintenance, repairs, etc, and it is well worth it. It is part of the pride of boat ownership, and we understand that. We are boat people, too! This cover offers an upgrade over our 600d Ultra3 cover, in that the material is thicker and heavier duty. These are for folks that want the best cover that they can get. It is difficult to judge or predict how heavy duty a boat cover is, as there just are so many factors. But, the key factor is the 'd' or 'denier' 'rating'. Denier is a direct indicator of the thickness of the material. Therefore, it is an indirect (but accurate) indicator of how 'heavy duty' the cover is. Now, the industry standard seems to be 200d or 300d. You will even see some 150d covers. These lighter duty covers are generally what the big box retail stores, mass merchandisers, and huge marine mail order outfits sell. We do not take that approach. The absolute minimum we carry is a 600d, and they are fantastic. We have sold tens of thousands of them with solid warranties, and warranty issues are just almost nonexistent. Now, to explain the 'denier' number in more detail, the 'd' or 'denier' rating is much like a thread count on a bed sheet. The higher the number, the thicker and heavier the material. Preventative maintenance often seems expensive, but it almost always more than pays for itself quickly. As a preventative maintenance tool, these cannot be beaten. These are waterproof, and 100% UV proof. The UV protection is often overlooked, but when you see a boat with cracked/weathered seats, the sun did almost all of that. The idea of having a waterproof cover is important, but the UV protection is almost always more important. These provide water protection, sun protection, leaf protection, bird protection, etc...just the best protection against nature in general. Have a look at our covers, and if we can be of any additional assistance, feel free to call us at 1-800-309-5190. We will be glad to help you. If you are considering buying a pontoon boat cover and you are confused about what is out there, you owe it to yourself to read through this. Whether you buy from us or not, this will give you a good understanding of what is out there. Reading this could very well save you many hours of researching, thinking, and sorting information about boat covers. It also may save you many many dollars. Reading this will help you make an educated decision concerning what pontoon boat cover you want. Again, whether you buy from us or not, if you are potentially in the market for a pontoon boat cover, you owe it to yourself to read this. It will only take a few minutes. We appreciate you taking the time to look. First of all, there are hundreds or maybe thousands of brands and types of pontoon boat covers out there. We have studied these extensively, and they can be grouped into 3 general categories of covers. 1. TARPS...You will see some boats covered with tarps. Tarps are commercially available and inexpensive, but they generally do not look good and do not last long. The are also somewhat difficult to deal with since they are big and flat and are not made in any way specifically to cover a boat. They also are just a moisture barrier, so they keep water out, but also keep water in, which can cause serious damage in terms of rot, mold, mildew, etc. We would highly recommend avoiding tarps as boat covers. 2. CUSTOM COVERS...You will see some very expensive covers ($1000 to $2000 range) These are custom made for a given boat and an upholstery shop has to make them, or you would have to normally buy one from the company that made your boat. They are a very good fit, but are very expensive. The quality is good, but is not necessarily better than what we sell. They probably will fit better, as it is a 'custom' cover but there is a hefty price to pay. Also, they are generally awkward, heavy, and difficult to install. Often, they will have snaps to hold them on, and dealing with a hundred or more straps is not super fun, generally. A boat dealer recently told us that it takes 4 people to install his customer cover. 3. SEMI-CUSTOM COVERS... What we sell is right in between these 2 referenced previously. We call ours semi-custom covers. They provide a custom fit most of the time for most boats. Our covers are made to cover the entire deck area. We carry covers that should be very close to the size you need. Our covers are staggered in 2 foot increments, and we can normally fit one very closely to your boat. Sometimes there is material left over,(should be a foot or two at the most). Normally, a foot or so of extra material is not important at all. Sometimes, there is no leftover material. It just depends on the size layout of your boat. Our covers always cover the entire top and the entire sides, or the entire top and most of the sides of your playpen area. The ability of this cover to do such is again greatly influenced by the layout of your boat. If your boat has a lot of 'stuff' that is higher than the rails, such as a tall console, bimini top, tall seats, etc, this will make it to where the cover may not can cover all the way down the sides of your boat. Please see our pictures. There are tremendous economies to be found by investing in one of our covers. Our new Ultra 3 covers are semi custom covers and have many important advantages over almost any other cover out there, besides the price. 1. 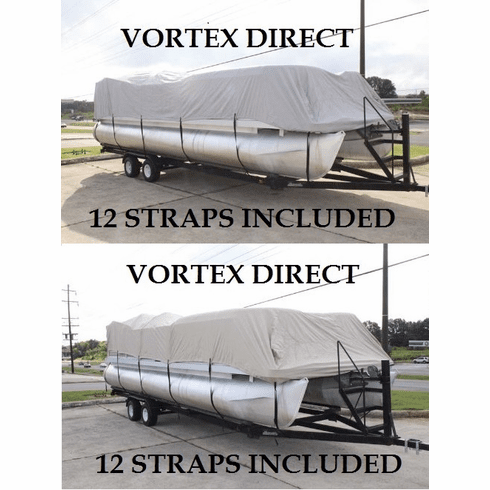 The new Vortex 1200D pontoon boat covers are suitable for storage, mooring, or trailering. (When trailering, cover must be totally secured so there is no possibility loose material. Wind resistance will damage your cover. Because this is difficult, warranty does not cover trailering. So be sure to secure properly). Many covers are made for a specific type of use. Ours are made for all 3. 2. The new Vortex 1200D pontoon boat covers have the best strap system available. Research has shown that straps over the top and completely under the boat do very little good. (Also, ever crawled up under a boat on a trailer to run straps? Ever bumped your head under there?) Our covers are made with a new system whereby a series of loops is sewn to the fabric and the strap goes through that loop, around your pontoon/and or trailer, and snaps together..very very simple and very very strong. 3. 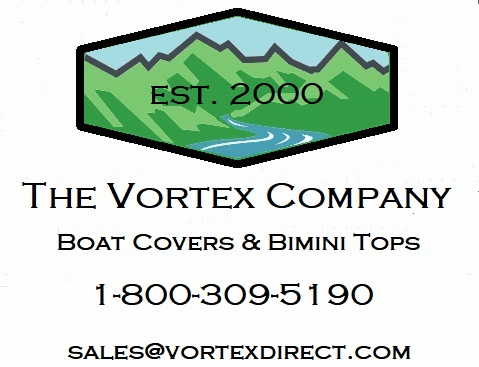 The new Vortex 1200D pontoon boat covers do not have grommets to scratch your boat. 4. The new Vortex 1200D pontoon boat covers have an elastic rope sewn into the hem..to help hold the cover tightly to your boat. This is very nice for mooring. Say you have your boat down at the dock and just want to cover it temporarily. Most likely, you would not need straps, etc for such a project. The elastic will hold it in place. Then, for storage or trailering, you can fasten the straps for a more secure fit. The elastic makes putting the cover on the boat much easier. It makes it a very easy 2 person job, and a reasonably easy one person job. 5. The new Vortex 1200d pontoon boat covers are proportionally 4 to 8 times thicker and heavier duty than most covers you will see out there. A good boat cover will pay for itself many times over in terms of protection of your environment. The general idea is to protect your boat from the elements (rain, snow, sun, etc. ) The function of a cover is to take the abuse from the elements that is normally destined for your boat. Our covers are good for performing that function in 3 main areas (mooring, storage, and trailering). A good cover will pay for itself very quickly. Consider the time put into a thorough cleaning, maybe for the first outing of the spring�.That several hours of cleaning could have been avoided or greatly minimized by use of a good cover. Take a look at our pictures. They are real. Beware of sellers with computer generated pictures of perfect fit covers. Beware of sellers that sell boat covers that maybe have never even tried one of their covers on a boat, and have no idea how the cover interacts with the boat. Boat covers are square. Boats are generally not square. Boats have features and items installed on them that make a less than a perfect fit a necessity/reality. We take real pics of the real product in real world applications so you will know exactly what to expect. We strive to set very realistic expectations of our products. It is extremely safe to say that the money you invest in a quality cover will be returned to you many times over during the lifetime of a boat, in terms of reduced repair, reduced wear and tear, less fading, less faded and stained upholstery, carpet, etc, and the lower $ required to repair these issues. We have 2 general types of boat covers. Within these, we will have our 1200d and 600d. We have several sizes for each main type of cover, and generally, we want to size a boat cover to fit as snugly as possible, but not so snugly that it will not fit! It certainly has to be big enough, but not too big. It often seems like a good idea to get an oversized cover, but, we have found, through years and years of experience, that the extra material is often cumbersome and difficult to deal with. So, unless you really have some outstanding circumstances, go with the smallest cover that will actually fit your boat. If in doubt, please call us, and we will help you figure it out. We gladly offer no-obligation consultations. It is in all of our best interests to work together to get you the best possible cover. Also, for most types and sizes, we will have several colors to choose from. For most types and sizes, we will have blue, grey, beige, burgundy, and green. This particular listing here will be for a particular size and color, but we will have all available options listed, or you can call us for assistance at 1-800-309-5190. For our pontoon covers, they are sized like this. We carry several lengths (currently 16', 18', 20', 22', 24', 26', and 28�.) We like to size these covers to fit the deck area of the boat, not just the playpen. These Ultra covers have the elastic cord sewn into the hem, and we like for that elastic cord to 'grab' underneath the edge of the deck all the way around. Sometimes, manufacturers of pontoon boats like to get all they can out their descriptions and model numbers, so their measurements normally apply to the pontoons. So, of a boat is called a 24', that is generally referring to the length of the pontoons. The deck length is what we want to cover, and that is the measurement that is important to us. Beware of what is stamped on the side of your boat, and of what your title says, etc. It can be a little misleading. Our covers are designed to cover the top of the boat, and down the sides. The side of the cover, or 'skirt' is an industry leading 37". Most manufacturers offer a skirt that is 12" or so shorter than that. Our industry leading 37" skirt ensures better coverage of your boat, and therefore better protection of your investment. HERE IS WHAT YOU CAN EXPECT FROM US. 1. ITEM YOU RECEIVE WILL BE WHAT YOU SEE PICTURED AND DESCRIBED. 2. WE ARE EASY TO GET IN TOUCH WITH...YOU CAN EMAIL US OR EVEN CALL US DURING THE HOURS ABOVE AT 1-800-309-5190. The cover is made from marine grade polyester. The cover is made from 1200d or 1200 denier solution dyed polyester. 'Solution died' simply means that the thread is dyed before it is woven into the material, as opposed to the fabric being woven or produced, then dyed. This process allows for better penetration of the dye, and better colorfastness. This makes the cover very resistant to fading. The fabric is then coated twice with polyurethane on the bottom or downside, UV protected, and mildew protected. What this all adds up to is the best cover available. It is several times thicker than what you see readily available commercially. It is designed to keep water out, as it is WATERPROOF. Yet, water vapor can permeate it, so it will keep moisture out, but will not keep moisture in! 1200D are 600d are indirect measurements of density and weight. The higher the number, the heavier, thicker, and heavier duty. This is the thickest cover you will find. You will see a lot of 300d, even 150d covers, which are proportionally half as thick and 1/4 as thick as our covers. These are very waterproof. These will collect water. If you are going to use this for storage or in any condition on your boat where rain could collect on it, we would highly recommend some type of support system. We carry a very simple reasonably priced support system. Many customers of ours have successfully built a small framework to hold it up. It would not have to be anything incredibly complex, just enough to create and arch so it can shed rather than collect water. A very common and economical way to do this is to build a support system or 'skeleton' with pvc pipe. Grey electrical conduit works very well and is even less expensive. People have used saw horses, an empty garbage can or two., etc. Often, you do not have to spend any money on a support system. Shipping is free to anywhere in the contiguous United States. For shipping to anywhere else, please contact us. Please see pictures. This is not a disposable type cover. It is made for years and years of use. It has a 5 year warranty.